9002946 LEGO Star Wars Han Solo Watch is a Star Wars watch released in 2011. This set contains a watch with a Han Solo minifigure. 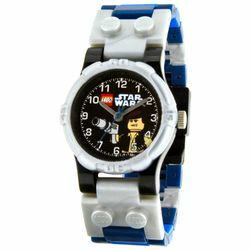 Most of the pieces are blue and white, and the watch's face is decorated with the LEGO Star Wars logo as well as an image of a Han Solo minifigure. Facts about "9002946 Han Solo Watch"